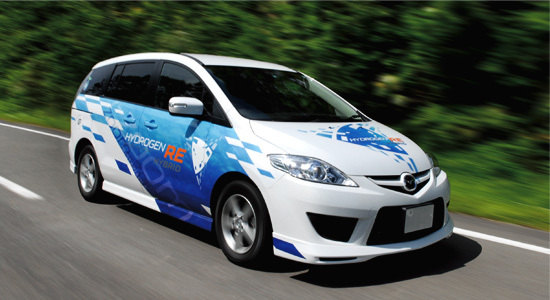 The Mazda Premacy Hydrogen RE Hybrid is a concept car that combines a hydrogen rotary engine and a hybrid system. First showcased at the 40th Tokyo Motor Show in 2007, Mazda began commercial leasing of the Premacy Hydrogen RE Hybrid in March 2009. The Premacy Hydrogen RE Hybrid borrows some technology from the RX-8 Hydrogen RE, such as the dual-fuel system that allows the car to run on petrol, this car features a hybrid system that greatly increases its driving range and power.